Dr. Miller’s CDs, MP3 downloads, and Cassettes feature his resonant, melodic voice, woven into a tapestry of beautiful music and the soothing sounds of nature. They induce a deeply relaxed, receptive state of consciousness similar to meditation and hypnosis, and enable you to transmit messages of wisdom and healing to your body and into the deepest levels of your being. Along the way you learn to let go of stress and tension, and to control pain and other symptoms. In addition, through repeated pleasurable listening, you can eliminate harmful habits and reach optimal levels of wellness and performance. To enhance Deep Healing, Dr. Miller’s Guided Imagery audio Programs draw richly upon your emotions, intellect and wisdom, and are fully compatible with both conventional and “alternative” medical therapies. In fact, these programs are widely recommended by physicians, and psychotherapists, by institutions like the Mayo Clinic and the Kaiser healthcare system, and by health practitioners of all persuasions. Each Guided Imagery Audio Program brings you two to four different healing or peak performance meditations, and often one or two heart-to-heart talks with Dr. Miller. Each is skillfully designed so you can listen hundreds of times, with a different experience each time. 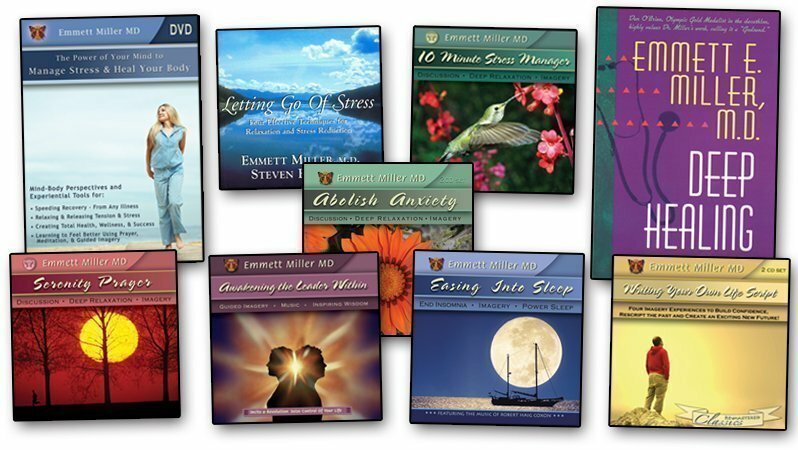 Deep Relaxation & Guided Imagery Programs: Most of Dr. Miller’s tapes and CDs feature one, two, or four inward healing journeys to accelerate healing and create peak performance. These are best experienced in a safe place, with eyes closed. Deep relaxation can also be achieved with eyes open, using one of Dr. Miller’s video productions, which add calming natural scenes to soothing and effective words and music. Heart to Heart Talks: These recordings don’t just give information, but are designed to help you experience more deeply what is most important for you to experience. This is Dr. Miller’s way of bringing you powerful information, but in a form where most people have no trouble listening while they’re doing other things, driving, etc. Heart to Heart distinguishes programs and portions of program (many programs contain both deep relaxation/ imagery and heart-to-heart talks). SYMPTOM SEARCH if you want help with a particular issue, symptom or illness. Many of the products allow you to listen to a brief excerpt as a sample. Also, go to the new Listening Station, which provides an excellent auditory introduction to Dr. Miller’s voice and techniques. Dr. Miller’s Greatest Hits, highlights his most sought-after recordings, and our Special Offers features unique or discounted items. Save Money; buy a Specially Priced Package. Each has been carefully selected to enhance and complement your deep healing. Order between 3 and 14 items and receive a 10% discount on your order. Order 15 or more items and receive a 40% discount on your order. Special Discounts for any order that contains one or more Comprehensive Programs. Special Discount for purchase of the entire Greatest Hits Library. Order online using our secure shopping cart system by just clicking on the icon next to the item you would like to purchase. Our secure system makes it easy and fun. E-mail us with your questions.